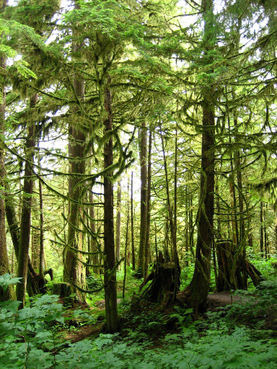 The Tongass Rainforest in Alaska (the largest national forest in America) is the latest victim to forest logging. The Bush administration moved to reverse the Roadless Rule of the Clinton area, designed to protect 58 million acres of roadless wild forests in 39 states. The administration's plan to overturn the rule will leave 2.4 acres of wild roadless backcountry open to cutting and new logging roads. This plan was released today, after being order two years ago by the federal court under claims that the Roadless Rule was invalid due to a "gross overestimation of demand for Tongass logs." To make matters even more interesting, the new plan will not raise any revenue for the US government and will expect US taxpayers to pay for the building of roads so that timber companies can access the forest. "The Roadless Rule and the courts have sheltered many of the last, best places in our national forests, even during an administration hostile to forest protection. Now, with one foot out the door, Bush officials are looking for whatever way they can to give away the family silver," said Franz Matzner at the Natural Resources Defense Council. George Vickerey of the Tongass Conservation Society expressed tremendous concern over the recent announcement. "These are special places critical to the region's incredible fish, deer and other wildlife, world-famous recreational opportunities, cherished subsistence practices, and the businesses and jobs that depend on the region's natural treasures. These are the very things that make Southeast Alaskans most want to live here."